It’s hard to believe it’s already Friday, but in the same breath I’ll say it’s been a long week. 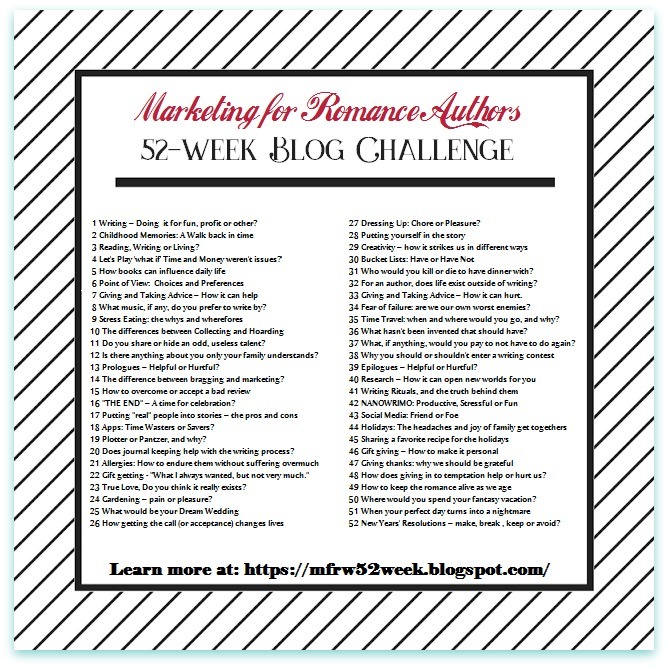 Regardless how fast or slow, it is time for another Marketing for Romance Writers 52-Week Blog Challenge post. 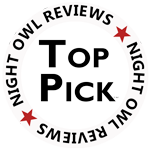 We use the Hashtag #MFRWauthor. Week 16: Family, friends, and pets I’ve written into my books. In one of my books, a character is in martial arts. She’s a test away from getting her black belt in Tae Kwon Do. My son is a second-degree black belt. I brought his character into this book for a brief scene. As a black belt, he teaches classes, so he advised me on what would happen when a new student comes to observe a class to see if they might be the right fit. Many of my heroines have best friends. I base their relationship on my own relationship with my best friend though I’ve never brought her into the book as herself. Those of you who have been around a while, might remember my best friend passed away nearly a year ago. A few months ago, another best friend from my past who had parted ways with me, came back into my life. One day, some of our antics could end up in a book. Shh, you didn’t hear that from me. Another character is based on a friend’s mother though I haven’t used her name nor have I written in any of the things she had done to her daughter. It was only the idea for this particular fictitious mother’s attitude to be patterned after this mother. And, no, it isn’t Judy Carlson for readers who are familiar with my Double Dutch Ranch Series. Quite the opposite of Judy, in fact. By now, anyone who knows me, knows I wrote my dog Kasha into Whispers of Forever: Mending Christmas because I knew her days were numbered, and I wanted to do it as a tribute to her. I’m so glad I did because now she’s gone, but she lives on in my books. She’s mentioned in Finding Kimber and the third book, a work in progress. I can see her in future books even if she’s doing nothing more than wandering around the barn or having a character reach down to pat her. One of my senior and most gentle horses in the Double Dutch Ranch Series is based on an elderly horse from the stable where I used to spend time. I don’t know if I responded to this topic correctly by saying some characters are based on real people. If not, then the only real family/fur baby members I wrote into a book is my son and the real animals are Kasha and the horse. How about you, authors? Do you use animals in your stories? Readers? Do you like reading books with fur babies in them? Do you think it brings something to the story? Please join us on this Blog Hop by visiting other participating authors HERE.